Following a great weekend of practice, the Ducks took the practice field Monday for their first game-week practice. At this point in preparation, it’s more about focusing on the little things that help make teams great. 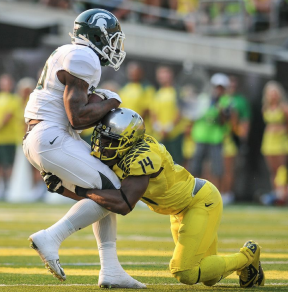 And there is no one better at the little things than All-American Cornerback Ifo Ekpre-Olomu. Ekpre-Olomu makes another tackle, vs. Michigan State. Ekpre-Olomu suffered a torn acl in practice a few weeks ago and was ruled out from playing in the Rose Bowl. The natural-born leader was in Los Angeles for a doctor’s appointment, and decided to make an appearance at practice yesterday, reported by Rob Moseley of goducks.com. His appearance was expected by most, but for Ekpre-Olomu who has been dealing with the emotions of his injury and being away from the team for over a week, this was something he needed. Toward the end of practice, Ekpre-Olomu had a little pow-wow with the defensive backs. As the leader of the group, Ekpre-Olomu’s experience and talent was invaluable during the regular season. Against Florida State, he might not be there physically, but he will most definitely be there in spirit, and he wanted to let his guys know that. Freshman Chris Seisay is expected to take over his role against the Seminoles. The Ducks have made plenty of progress in practice since arriving in Los Angeles on Christmas Day. As always, there is much more work to be done, and FishDuck.com will bring you all the important news from the next 48 hours leading up to the big game.